On March 21, FMR hosted an event to wrap up our year of research and outreach around reconnecting the Mighty Mississippi to North Minneapolis neighborhoods. We spent the evening with over 60 North residents listening to a presentation by FMR's research assistant Eric King, who's been working with us for the past 15 months as part of his graduate studies at the University of Minnesota's Center for Urban and Regional Affairs. A panel discussion followed with experts on gentrification, environmental justice and the state's long-term vision for healing the community–river divide created by Interstate 94. Panelists included CURA Research Associate Dr. Brittany Lewis, Senior Policy Aide for Environmental Justice and Sustainability to the Mayor of Minneapolis Halston Sleets and MnDOT I-94 Project Manager Brian Isaacson. A video of the event is available here. King's 2016 overview included how his research has evolved based on community input. He began his research by simply looking at what physical changes needed to be made so that Northside pedestrians and bicyclists could safely travel to and from the Mississippi River. Community feedback pushed him to identify whom to talk to implement change along the seven routes across I-94 and whether or not projects to create improvements were in the planning pipeline. As he reported that information in summer 2016, community members pointed out that no matter how many great bike/ped amenities were put into place, many people still wouldn't use them if larger issues like air pollution or gentrification/displacement were not also addressed. This led King's research into studying not just the physical conditions like poor crosswalks, but intrapersonal factors like not having free time, and interpersonal considerations like not feeling welcome in the parks and other constraints. 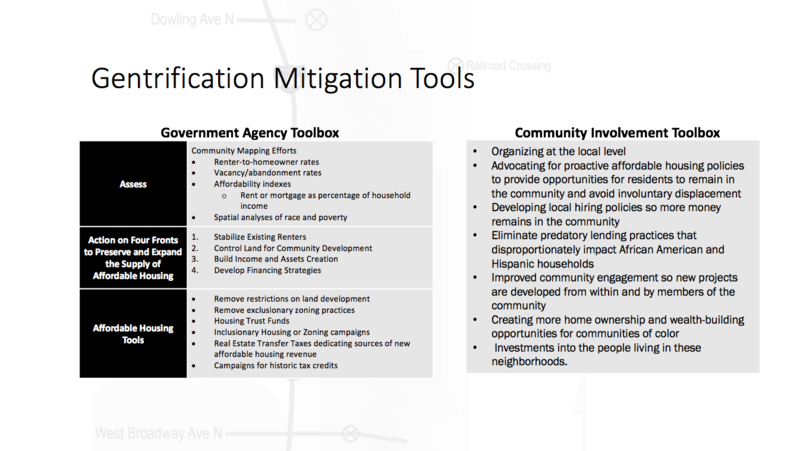 He reported on policy tools that could help prevent displacement of current residents. And researched an option popular amongst many Northsiders: the possibility of a land bridge over I-94 to the river. This included a review of innovative land bridge/freeway cap examples from around the world. The panel discussion that followed was full of passion and learning. We heard from Dr. Lewis about how every community wants to have amenities and the importance of proceeding humbly as we continue this work. Sleets discussed the importance of experiencing natural environments and how there are not yet good opportunities for this in North Minneapolis. Isaacson shared that MnDOT is interested in the land bridge/freeway cap idea and working with communities throughout the metro area to consider the potential options. This event marked the end of 15 months of intentional research and outreach on how to better connect North Minneapolis with the Mississippi River. Now, we'll shift our focus to advocate for improved connections, using the research findings. We look forward to continuing to engage with and rely on those who have participated in this work so far — including neighbors, neighborhood/non-profit leaders, other advocacy groups, and others — to effectively advocate for these community-identified changes. If you're interested in joining the advocacy effort to improve connections between North and the Mississippi, please sign up to become a River Guardian and we'll contact you about how to get involved. Be sure to mark that you're interested in city and local issues and include your ZIP code. FMR has long advocated for a greener and more accessible riverfront in the Above the Falls stretch of the Mississippi River in North and Northeast Minneapolis. • To learn more, see the cover story "Seizing opportunities Above the Falls — Striving for river trails, parks and connections in North Minneapolis" in the spring 2016 FMR newsletter. • To get involved in hands-on habitat restoration projects along the North and Northeast Minneapolis riverfronts, join the Above the Falls River Stewards.